When users complain, engineers can be overwhelmed sifting through a sea of performance metrics to deduce what users experienced and where the problem resides. It can be even more confusing when all indicators are green, yet user experience problems persist. According to Forrester Research, one-third of user complaints linger without resolution for a month or are never resolved. 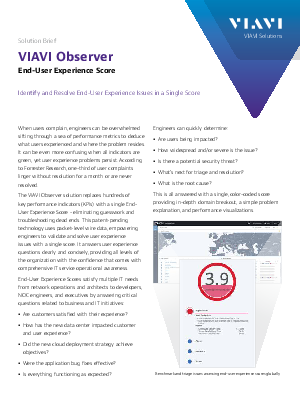 The VIAVI Observer solution replaces hundreds of key performance indicators (KPIs) with a single EndUser Experience Score - eliminating guesswork and troubleshooting dead ends. This patent-pending technology uses packet-level wire data, empowering engineers to validate and solve user experience issues with a single score. It answers user experience questions clearly and concisely, providing all levels of the organization with the confidence that comes with comprehensive IT service operational awareness. End-User Experience Scores satisfy multiple IT needs from network operations and architects to developers, NOC engineers, and executives by answering critical questions related to business and IT initiatives.